For many years, Canadian whisky was what one writer has called a compromise spirit, meaning it did not achieve the quality of the single malt or bourbon category, but had a ready market due to its versatility (especially for mixing) and price. The reason for this has a complex historical and technological background, but to summarize, Canadian whisky is typically a blend. A blend means, most of it is a vodka-like, neutral alcohol (made from grain), but aged in wood for at least three years. This aging imparts a degree of “whisky” flavour, but the neutrality of the spirit when young means it can never mature in the way a traditional whisky would. The traditional types were and are made in pot stills. The more industrial and modern column still is used to make the neutral type but it can also be used to make the older type. It is not the type of still which counts but the type of whisky you want to make. Using a little of this traditional whisky (5%-10%) to “flavour” a much larger amount of aged neutral spirit became the Canadian style. Often too, sherry or sugar of some kind is added to round out the whisky’s flavour or give it a browner tint. For almost 60 years, this became the only style you could buy in Canada that was produced here. To drink straight whisky – in effect the flavouring whisky uncut – you had to buy U.S. bourbon or single malt whisky. The Canadian distillers made the straight type, but used it only for blending. In America and Scotland, straight whiskeys were also used for blending – Seagram 7 Crown, Cutty Sark, say – but the straights – the original type – were never taken off the market as in Canada. With the rise of the whisky renaissance, Canadian distillers have started to release their straight whiskies uncut or produce blends with more straight whiskey than in the past. In either case, the flavour result will be much more impactful than the classic restrained Canadian blend such as Seagram V.O. or Alberta Premium. Dark Horse, Lot 40, Wiser’s Legacy, Canadian Club Chairman’s Select 100% Rye, Seagram Northern Harvest, all fall in the new category, they are very flavourful from being 100% straight or blends in which a high percentage of straight appears. Most of them are, for the straight element, rather young in palate. Even when aged seemingly long (7-10 years), account must be taken of the fact that Canadian distillers, with some exceptions, age their whiskeys in reused oak barrels vs. the new charred barrels used by U.S. bourbon distillers. The reused barrel is perfectly good to age whisky – that is what the Scots use for their famous malts – but it takes a long time for straight whisky to acquire its maximum quality in such wood. Putting it a different way, few people today would rate a single malt very high which isn’t at least 10 years old and often the benchmark starts from 12. Yet most Canadian straights produced for blending are much less aged than that. The reason is partly cost but also, a younger whisky will make more flavour impact on a large amount of near-neutral spirit than an old, well-modulated spirit. On its own, it may taste, as some of the new releases do, piney/congeneric, but that can be a plus for blending. ii) made from a mash of >50% corn plus rye and barley malt. Last Barrels was aged in all-reused barrels, and bourbon by U.S. law is aged in new charred barrels. However, the 14 year period for which Last Barrels was matured more or less equates in palate to what you would get with half that time in new charred wood. The new charred barrel has a “red layer” (just under the black char layer) which imparts caramelized wood sugars to the bourbon. It is said to be exhausted after one fill of bourbon, but while it will take longer, you will ultimately get similar rich, wood sugar qualities in the whisky as any good malt will show. Last Barrels tastes very much like a high quality bourbon. I doubt people would place it as “Canadian” if included in a blind bourbon tasting. But it is Canadian because it was made here and qualifies as Canadian whisky under our broad definition. The important thing to appreciate is, the straight whiskeys used in Canada for blending always were U.S., Scots, or Irish-type straight whiskeys. We never had a straight style of our own, we had a blended style of our own. 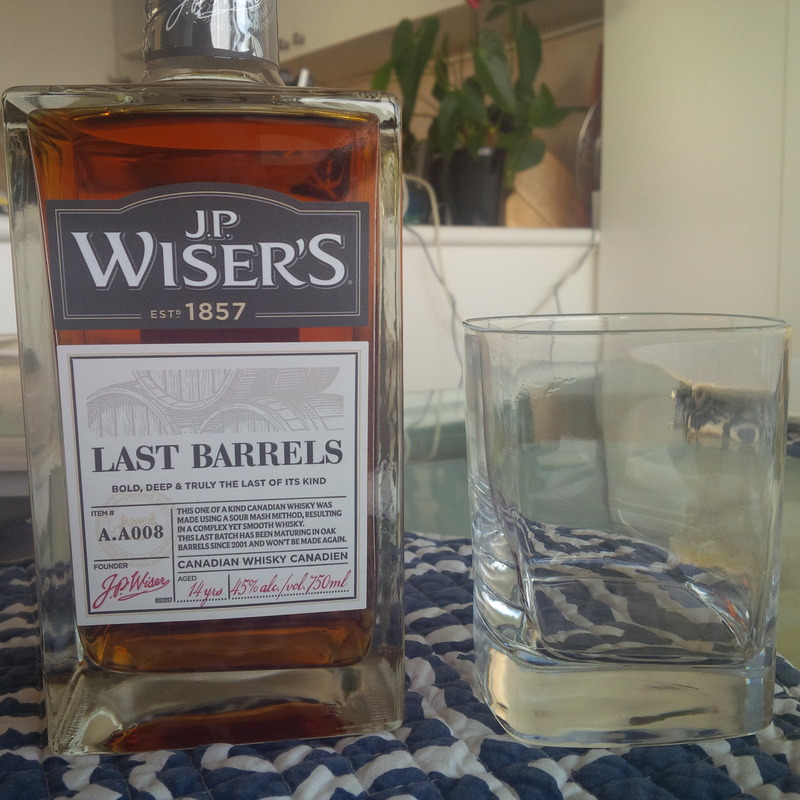 Canadian distillers should release more whiskies like Last Barrels. Their straight character – I use the term not in the American technical sense but in a broader, international one – lends an inimitable traditional whisky character. You can age the typical Canadian blend until the cows come home, and some distillers do, but more wood doesn’t equal more whisky quality, it just means more wood. Yes, other things happen too with aging any spirit. But from a palate standpoint, there is no substitute for genuine whisky meaning in particular whisky distilled under 80% abv as all malt is, all bourbon is, all straight rye is. (All brandy and tequila too, by the way). This is due to its complex chemical composition which results from low proof off the still vs. the nearly pure ethanol-and-water of spirit distilled at 95% pure alcohol. The blends are all very well to be sure, they can be sold at a reasonable price – generally half or less what Last Barrels costs – and are good for mixing. But as mentioned, they cannot be compared in palate to the original straight whiskies.